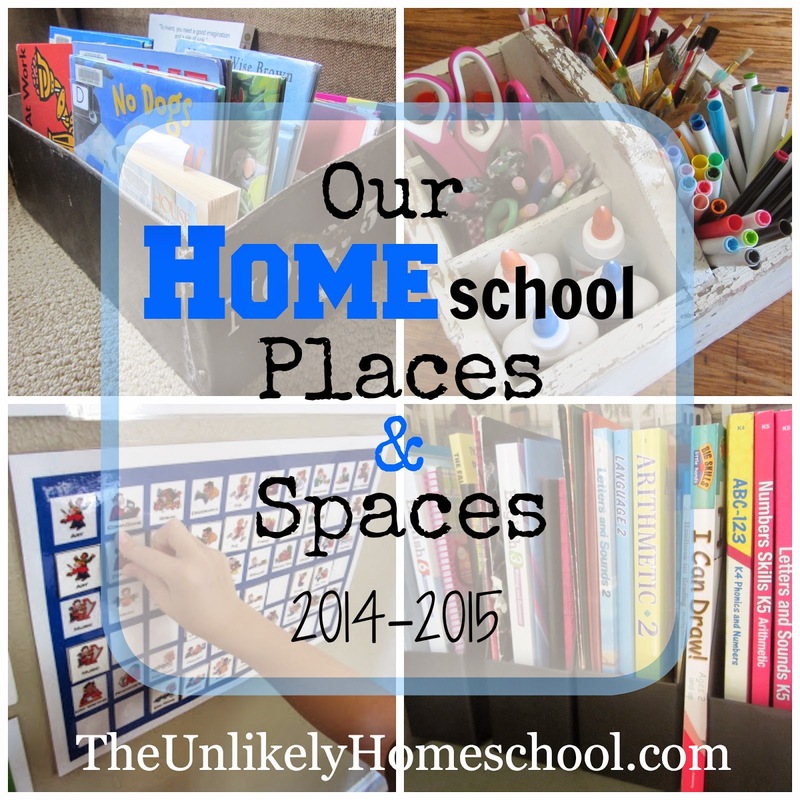 I'd had hopes that my 2014-2015 homeschool "tour" would be in a NEW space and a NEW place. But alas, our house still hasn't sold yet. So, we'll press on and be content with cottage-schooling for another year. As I've mentioned many times before, we live in a teensy-weensy little home (One bathroom...seven people...'nough said!). But, we are so grateful to have a lovely, memory-filled place to call our own and have learned to use every square inch of it. 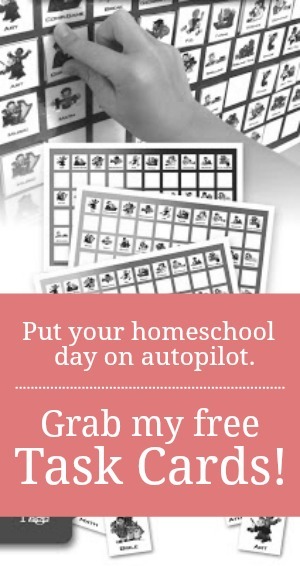 In our pursuit to keep the HOME part of homeschool a top priority, we choose not to have a "classroom" but opt instead to mesh learning with life by spilling school time into every area of the house. We do, however, need a place to store all our books, tools, paper, books, books...and did I mention, books?! Our dining room has defaulted to our school-time catchall. In addition, we have gotten pretty creative over the years and have learned to camouflage our learning so that it blends into our eclectic, early-American decor. On the buffet table of the hutch, you'll find a long, skinny basket that holds all of my currently-in-use flashcards, a magnetic calendar, all of my personal notebooks and binders, and the Bible we use for family devotions (not pictured). Inside the hutch, are my parent/teacher resources, a few of the kids' books that will not fit in their personal storage bins, art paper, science kits, and larger odds-and-ends learning manipulatives. The top four drawers are mine to store stationary supplies. And the children have claimed the bottom three for their non-art related supplies. Our next big work-horse is this antique dresser that has passed through three generations of women in my family. I always sit at our dining room table within arms reach of both this upright dresser and the green hutch so that if I need something while I'm teaching a lesson, I don't even have to get up. (Call it lazy, if you must. I call it efficient!) Underneath the dresser is a cardboard box lid full of scrap paper. And behind it, between the dresser and the wall, you'll find our collection of large, white project boards...a MUST HAVE for project-based learning in a small space. Drawer 2: small math counters, dice, dot-a-dot blotters, learning magnets, etc. On top of the dresser, you'll find the kids' book bins. This is where they keep the majority of their personal workbooks, journals, folders, current mom-assigned library books, and task cards. Over the years, I've found it much more efficient to keep our living-literature books that we use for specific subjects near the places in our home where we actually DO that subject. Using baskets and antique crates have been a great way to control the chaos while still keeping true to our comfy-cottage decor. Formerly an old milk crate, this little wooden bin is the center of our passion-directed learning. Three out of my four oldest kids never stray too far from this art caddy that houses all our basic art supplies. We also have one plastic tub that holds our more professional grade art supplies and another one that holds clean junk like old oatmeal canisters, egg cartons, mint tins, magazines, cardboard, etc. that can be up-cycled into any number of fantastic creations. These two tubs are stored at the bottom of a closet. And lastly, you'll find my wall-of-sanity...I mean, the wall that holds the base charts to our Task Card system. This coming year, our wall will be without pink as Sweetie Pea will be using the same concept in a school planner and will no longer need a base chart and cards. And that completes our tour! In case you're curious, all our currently-not-in-use books and curriculum are stored in a large cupboard and a few plastic tubs in the basement. I'd invite you down the steps to see, but you'd have to pass through the boys' room along the way and well...you might just end up tripping over a mound of Legos. For your safety, I think you'll just have to use your imagination. Thanks for swinging in for a look-see. I would love to hear more about how you are going to implement this system for your oldest in her planner. I have a 5th grader I'm pulling out of public school to homeschool for the first time and we need something a little more "grown up" then the wall task card system. I love it though. I kinda wish she was little and I could use it. Any ideas on how to implement this for the older kids would be great! Thanks! This year will be her first year with a planner. She's going into 6th. So, we, too are in uncharted territory. I have a few thoughts up my sleeve. We'll see how it goes. I was just wondering if your house sold or not. I'll be praying for a speedy sale! I'd like to sell ours as well (it's not currently for sale, but I'm always looking), but the Lord is most likely in the business of teaching me patience lately...in many respects. :) I hope I learn quickly! Yes, Heidi. We did. I wrote earlier on another post that we are waiting for his first day back at school to write back. It kinda helps make the first day really special. I'm sure you didn't see that as I wrote a few days later than your response. Sorry. Please tell him, that we haven't forgotten. He'll get a letter in a few weeks. Our first week is the end of Aug. Thanks for your prayers for our house. I'm trusting that the Lord has a plan and it will sell in His time, not ours. You are simply hilarious! I like your writing so much. I think that you should write a book! I like your ideas a lot... Thanks for sharing! I'll preface all my comments about TOG by saying that I am a TOTAL NEWBIE with the program. That being said, I, too, prefer hard copy. I was able to find a Teacher's Guide used online. I went through the book list and determined which books were used for 5 weeks or more and have been purchasing as many used as I can and new if I must. All the rest, I will get from the library or my state's interlibrary loan program. 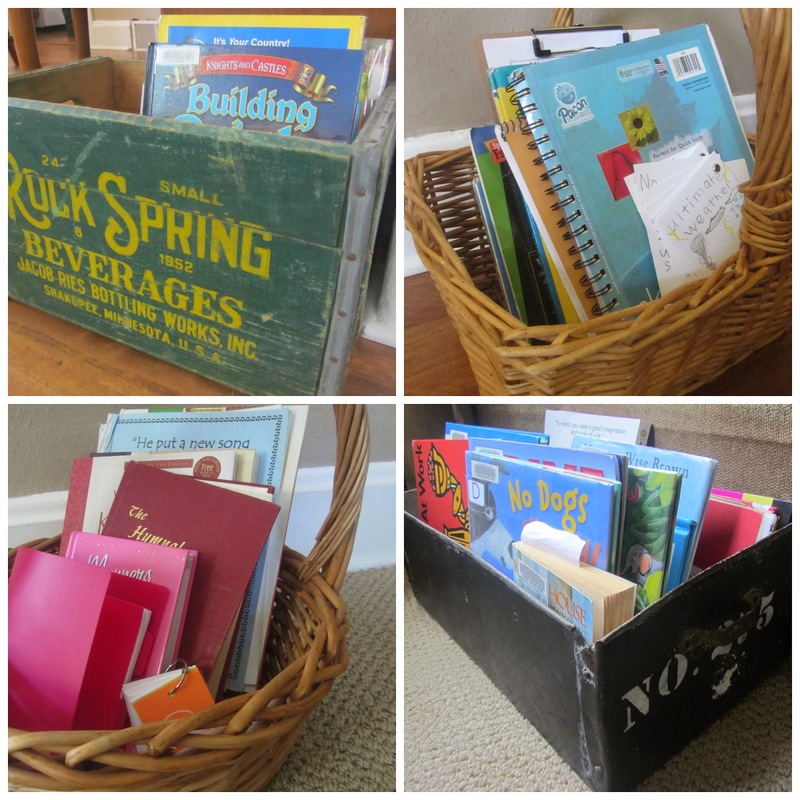 I love your mix of old an new containers to corral your homeschool stuff! Your video last year really helped me to think through my homeschool! I really like your space, I hope you have a wonderfully productive school year. I love all your antique looking things! The hutch is beautiful and the baskets throughout the house is such a wonderful idea. I love all the old, re purposed pieces here. It makes it feel so much more home-y and less school-y! That was our goal! So glad to know that we achieved it, thanks! So enjoyed seeing your pretty space and how you are making it work, while you wait! Looks great. Your hutch is really pretty. I love your set up a lot. I saw it the other day and didn't get the chance to comment. I look forward to seeing what your new space will be like if you are this creative and organized in your small space. Thank you. We hope to be a new place soon, but are happy to stay here if that is where God would have us be! Will you be writing in the planner for you daughter, telling her what to write, or letting her handle it all herself? My daughter is also nearing the age where a planner may be more appropriate than our current system.